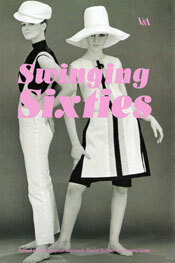 If you’re not aware, the V&A will be running a Swinging London exhibition from 6th June 2006 through to 25th February 2007, featuring designs by Mary Quant, Ossie Clark, Pierre Cardin and Paco Rabanne among others, covering the period from the mid 1950s (when Mary Quant established her first boutique) to the early 1970s. Through the display of around 60 garments, Sixties Fashion will show how key ‘looks’ evolved in London, the influence of King’s Road and Carnaby Street and their impact on international trends. We’ll have more on this as the exhibition approaches. We’ve already picked up our catalogue and have to say, it’s a "must buy". Swinging Sixties edited by Christopher Breward, David Gilbert and Jenny Lister is a mix of archive images, well-written pieces about the fashion world and beyond and one of the most exhaustive bibliographies I’ve ever encountered, not to mention colour images of key pieces from the exhibition. You can pick up a copy now at the V&A. Hello. Love this site. We had Mod in the US too. You may want to check out this cool site where members from all over the world upload fashion images from the Mod era.